The Kent-based punk-four piece, Spoilers, may well be one of the most under-rated bands in the United Kingdom’s DIY scene right now. Having shared stages with bands such as Bad Cop/Bad Cop and Teenage Bottlerocket in recent years, as well as performing at the likes of Polite Riot Festival, Pie Race Festival and Dugstock, Spoilers have built themselves quite a strong underground following that could very well grow now their long-awaited album ‘Shortcuts’ is out for us all to here. 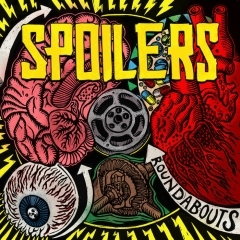 Spoilers are unapologetically skate-punk through and through, drawing comparisons to the likes of Snuff and Osker with their highly energetic delivery of up-tempo drum patterns, distorted riffs and Dan Goathams rather distinctive raspy singing voice that is ever so infectious. “Shortcuts” picks up where Spoilers’ 2015 EP, “Stay Afloat” left off, providing us with catchy anthems that are both upbeat, yet somehow angst-ridden, with melodies that invite the listener to hum along at any given change. 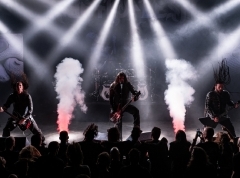 We get this instantly with the opening title track, we are treated to a verse with fast beats that make you want to bang your head and rock out, then comes the kind of anthem chorus that is primed for fans to join in with. It’s a punchy start to the release that is followed up by the album’s lead single, “Roundabouts”, a chirpy little hit, showcases the melodic punk elements to the Kent outfit, with occasional slowed down elements and perky little guitar hooks and a bubblier delivery, it’s like a punchier pop-punk song in places. This is the formula that flourishes on this album, it’s fun-fuelled enough to make you want to sing along. At the same time, you also have the harder hitting tracks such as ‘See You Ringside’, which Spoilers unload crunchier riffs and more intensity upon us so we can open some pits and rock out, perhaps start some human pyramids which is popular in the UK punk scene these days. ‘Pushover’ might be a stronger example, probably the angriest song I’ve heard from the Kent outfit, shouted vocals, fast and erratic beats and tons of distortion thrown our way, this song sticks out like a sore thumb and it’s great. This just makes an infectious number like ‘Target Practice’ prick your ears even more with it’s happier, more melodic nature in comparison. ‘Roundabouts’ is a prime example of how good in a place the UK punk scene is at the moment. This album shows some depth from Spoilers that plenty of us wasn’t aware of, unleashing both the joyful elements that made ‘Stay Afloat’ stand out and a grittier side that helps add balance to the album. Spoilers have been incredibly impressive on the live scene, but even this release has been a surprise in how enjoyable it would be.